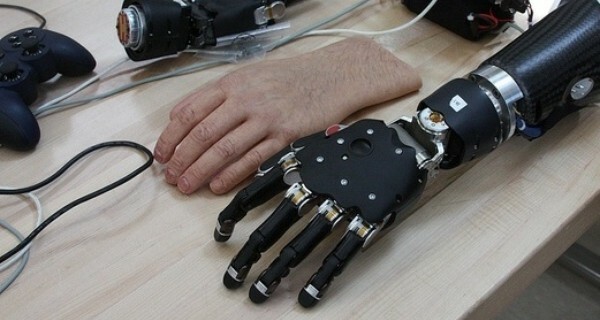 Controlling prosthetic limbs with thoughts. Controlling machines with our minds is a concept that for many of us retains a patina of science fiction, but it is rapidly becoming a practical reality. The John Hopkins Applied Physics Lab, funded by the US military research agency DARPA, has since 2006, been working on prosthetic limbs which can respond to the mere thoughts of an amputee. Whilst this is a research programme still a way off from full viability, their achievements so far are impressive. The first fully operational prototype was fitted onto a patient in May 2012, offering incredible flexibility and independent movement of fingers and thumb. In addition to "instructions" delivered via the patient’s own nervous system, more than 100 sensors provide feedback about pressure, vibration, temperature, surface texture and orientation, relative to the rest of the body. The funding for this programme was principally prompted by the US military’s desire to develop the next generation of prosthetics for its injured soldiers. However, the technology will equally benefit any amputee, and has further potential in any situation where delicate movements are required at a distance, such as bomb disposal.